Winner winner chicken dinner, congrats Tedi! My hero, Stephanie Howell, has started a monthly challenge where you blog your heart. 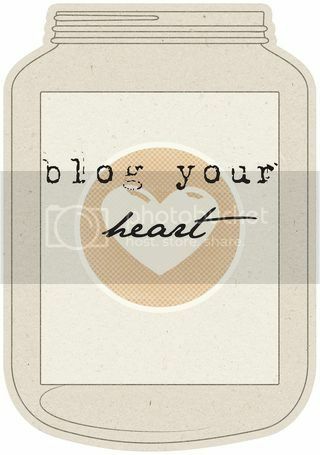 The point is to blog your heart. HONESTLY. It can be silly, funny, serious, short, or long... whatever you want it to be. As long as it is authentic. No sugar coating. It is what it is. So here goes! 1. I feel like I am always doing something and never have time to relax between working, mommying, and side jobs. I suppose I use up my relaxing time blogging... I need to learn how to prioritize. My list o' things to do is longer than the Nile. Sometimes I find myself dreaming that I could quit all my jobs and just live off the government. But I love my jobs. I think I'm a workaholic. I get great satisfaction crossing things off my to do list. 2. I need to learn to say no. Then maybe my list o' things to do won't be so long. 4. Fox is in this maddening stage where he ONLY wants ME! It makes it real hard to work when Chris is home and watching Fox but he's just screaming and reaching out for me. I need an office, off-site. Apparently Fox is grand when I'm gone, but as soon as I walk in the door it's meltdown city. It's just a phase, it's just a phase, it's just a phase. I need to remember that before I know it I'll be wishing desperately that he would still want and need me. 5. Keeping a clean and orderly house is starting to become a giant hassle with a toddler. But when the house is messy I get flustered. Not sure what to do about this one. But I'm afraid that like with The World of Color, it won't be going on that night or there'll be technical difficulties. We seem to have bad luck with stuff like that. 7. I worry too much. I'm getting more gray hairs by the day. I get headaches almost every day because either A) I'm stressed or B) I don't drink enough water. I don't like standing in long lines. I'm still working on my bucket list item of being patient. I'm not there yet. 8. I print my blog into books using Blog2Print. I make about 3 books a year and each book costs like $120+. I wait until a coupon code shows up in my email, which happens every few months. Finally a coupon arrived so I printed my blog book that ranges from May to August of this year. When it arrived I was so happy! Only to notice it was soft cover, not hard cover. Talk about an expensive mistake! I keep doing stupid things like this, not paying attention to details, forgetting things, not remembering important dates, picking out wrong stuff. I feel like I'm losing my mind sometimes! Okay, Blog Your Heart is over! I promise I'm a happy girl and I love my life :) It's just nice to put it all out there every once in awhile. I think we have a lot in common. A very lot. LOL Even the headache part. I've gotten a bit better with stuff, but I still struggle, too! Probably the only thing that's a little different is the conversation issue. I don't mind making small talk - but I also don't feel like I HAVE to talk, if you know what I mean! LOL That Halloween light display is too CRAZY! I saw it featured on CNN! this house reminds me a lot of that one house in sammamish during christmas time that "dances" to the music with lights. LOVE!! OH Paige---I love how you blog your heart and family! I feel like you are so honest with us--love your list of 10s today. I am also not very comfortable when I'm the center of attention--I think that has to do with not having a birthday party or many friends over when I was growing up. But no fear--if we are in a crowd together...I know we'd have FUN!!! I loved that video--wow! Talk about amazing decorations! And I love that you make silly mistakes too--I am constantly doing that! Only my mistakes have to do with cutting the paper wrong-TWICE! And it's my fav paper:) LOL! #3= me to a T! Wow #3 is so true with me. Even with my close friends I sometimes have trouble talking to them. They also did a house similar to that for Christmas here in Utah a few years ago. Paige!! I was trying to talk Al into driving to that house with me last night, but we were worried it wouldn't be going when we got there....lol I also need to try printing our blog into a book.....I want to see one of yours. We are TOO much alike! I laughed out loud when you talk about having conversations with people. I so feel your pain! I think that is why I love blogging and talking over email. However... sometimes even over email I feel like I am very misunderstood because I don't convey what I am really trying to say! Love this post! i'm soooo with you on number five. makes me feel like i'm taking crazy pills. ps- i'm sure you already know this but i really love your blog. Love this post PAige! And I too spend most of free time blogging, thinking of blog posts or making stuff to blog :) But it makes me happy, so I guess that counts! I am amazed that you get to keep your house clean. Kudos to you! Sending hugs too. You should be proud of all that you do and accomplish. I can't even manage to post anything on my blog because I don't feel I have anything interesting to say that people will want to read, so your way ahead of me lol. Keep truckin on...your doin great. We all lose our minds a little once we have kids! I feel like I am always, always cleaning our house with Miles, because, yep, I get sort of panicky when its messy. I can usually at least get him to help me with his toys by making it a game to put them back where they go. I always love to stop by and read your blog!!! I may not always post comments, but you always have the best pics and you have a good heart!!! I love that!!! Me and my kids watched the halloween video and were tempted to drive out to riverside to see it too!!!! happy halloween!! Oh my goodness, I'm the SAME way about crowds, talking to people, etc. Like, major anxiety! Then, I overcompensate by talking too quickly and being overly positive- a total mask for being scared to death! Good for you for putting it all out there! So loving to read your blog, Paige. It is honest and it's from the heart--so sweet! I hear you about Fox being so attached to you. Trust me, this doesn't last forever...my teenage boy is finally letting me go a bit with a safe distance. Back in the days he will not let me leave preschool..to the point the teacher asked ME to stay in school with him (ahhh!) and that lasted for 2 long months!! I mean,hello! !We paid for the preschool education! And yes, it's all good now...ENJOY! I just adore you. And I've met you in person and you were NOT weird. Haaaa! And Im right there with you on the never ending to do List. Ha! hehehe. you know the comment about sounding stupid when you talk to people who aren't your close friends or family? i feel like i do that all the time. i have word vomit but not with bad words just the wrong words and then i end up fixing my words and then i just kinda give up. i don't think i'm a shy person but i think when i first meet a person.. it's hard to figure out what to talk about and lets' face it.. it takes like 5 times hanging out with a girl before you have something to really talk about besides questions and answers that aren't really touching below the surface. HAHAHAHA. i love this. i feel EXACTLY the same since it's basically work and Jordan. You can do it! You can do it! I know you can.. cuz if you can't.. what about me? hahahahahaha you can you can you can! Ok, that halloween house just put a huge smile on my face. I love that people do stuff like that just for fun to make others happy. So cool. Keep your chin up! I could tell from your heartfelt post that you are a good person and mother. Keep up the good work. You won't worry so much if you weren't so good.